The music of ancient Egypt is pretty well known, the quality, kinds and mostly everything about it. However, very little is known about the instruments this music was played upon. The music has been preserved through the written word, oral traditions, inscriptions and depictions by paintings and sculptures. It is a little ironic that there is not much information by the way of musical instruments. What is known is that the musical instruments of ancient Egypt were simple as well as complex. 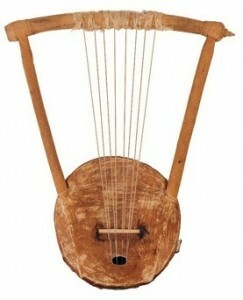 The simple ones included percussion instruments whereas the more complex ones were the harps. There were also variations in the origins of these instruments. Some were invented in Egypt and some were introduced by other nations and cultural interaction. Another admirable musical instrument was the hands. Clapping in time to the music is as old as time. The Egyptians used this to their full advantage. This is known because of the paintings and images found upon the tombs of the old kingdom. This practice has remained constant throughout the history of Egypt right from the ancient times. This clapping sound was also made by a boomerang-shaped instrument called clappers. These were used in ancient Egypt and Palestine as well. These clappers became more popular as time went by, often being painted and decorated with the face of the deity Hathor. Castanets also were used. The Middle Kingdom saw the emergence of the drums. However, these were rudimentarily made from barrels initially. These barrels were fashioned from the hollow of tree trunks. These were especially used in the army. Later on, drums began to be shaped like goblets and pots covered with skin with the bottom open. Soon, hooped drums, much like the ones we have today were introduced. The other percussion instruments fell into disuse. The sistrum, which was made like a metallic rattle attached to a handle were popularly used while worshipping Isis. We know for certain that bells were most definitely used as a musical instrument. The ancient Egyptians were also known to have played the cymbals. These are metal disc-shaped pair or objects that are attached to the hand and clanged together. Since the percussion instruments can only produce beats, the ancient Egyptians also had string and wind instruments. Flutes, pipes and double pipes were all used for creating music. It is possible that the birth place of the flute was ancient Egypt. Flutes are used until today in Egypt and go by the names of nay and uffaffa. Reeds were primarily used to make flutes and later on bronze was used to make them. They were short as well as really long. Clarinets, trumpets, oboes, lutes, flutes and harps, all were a part of the ancient Egyptian musical history.